Embezzlement – The theft or misappropriation of funds placed in one’s trust or belonging to one’s employer. It seems like all you have to do these days is pick up a newspaper and you will find an article about an embezzlement similar to the following one reported by WFAA.com: “Former Collin Street Bakery accountant accused of embezzling more than $16 million from the renowned fruitcake maker.” What concerns me most about this crime is that the embezzler was the accountant. The accountant for Collin Street Bakery worked for the company for fifteen years and was a trusted employee. He allegedly spent the last eight of those years embezzling $16.65 million dollars from his employer. The money was used to support an extravagant lifestyle that included 43 luxury automobiles and a house in New Mexico. The person who committed the embezzlement was the employee who understood how the accounting system worked and used that knowledge to cause 888 fraudulent checks to be sent to his personal creditors, according to the FBI. When I began my accounting career, I pledged to adhere to a Professional Code of Conduct. I also pledged to adhere to my employer’s Code of Business Conduct and Ethics. I take both pledges seriously. Evidentially there are a growing number of accountants who do not feel that codes of conduct apply to them. In the past few months, I have seen the term embezzlement used too often along with the title “Accountant.” The connection is usually in a newspaper article about an alleged embezzlement committed by an accountant. Why Are Embezzlements Happening So Often? According to a survey conducted by the Association of Certified Fraud Examiners (ACFE), instances of fraud are increasing nationwide, both in number of incidents and the dollar amount of the losses. Unfortunately this is nothing new. My first audit as a junior auditor forty-five years ago, uncovered an embezzlement of over $75,000 by the accountant. It was not the last audit assignment in which I encountered embezzlement. It may just be better media coverage that has brought this topic to our attention, but it seems to me that embezzlement is more common today than in the past. Maybe it is not just embezzlement. Maybe it is dishonesty in general. The following examples of embezzlements by accountants in the last five years shows that everyone— Fortune 100 companies, public companies, governmental entities, and small private companies—is susceptible to this crime. In each of these cases, the alleged fraud was perpetrated by a trusted accountant. How Can these Crimes be Prevented? Someone once said that “Trust is not an internal control it’s only a feeling.” In all of the examples listed above management or owners of the business trusted their accountant. Our inherent desire to believe that all of our employees are trustworthy gives us a false sense of security. Add a lack of resources or desire to implement necessary controls and you have a recipe for embezzlement. The solution to this problem is simple to identify, but often difficult to implement. Separation of duties and implementation or execution of a few internal controls could have prevented or at least reduced the losses in each of the embezzlements listed above. 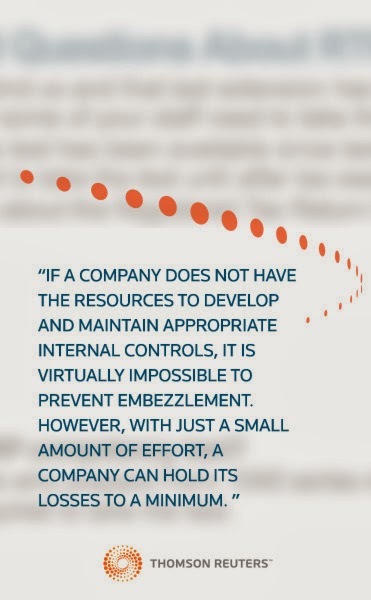 If a company does not have the resources to develop and maintain appropriate internal controls, it is virtually impossible to prevent embezzlement. However, with just a small amount of effort, a company can hold its losses to a minimum.